SAN BERNARDINO >> Rival groups of protestors tried to drown each other out Tuesday morning, arguing competing visions of U.S. immigration policies. Members of the Inland?Coalition of Immigrant Justice protested outside the U.S. Citizens and Immigration?Services building on West?Rialto Avenue, demanding the shut down of theImmigration and Customs Enforcement detention center in Adelanto, citing conditions at the privately run facility that they say has led to the deaths of three detainees. “We believe in family unity, that families are stronger together and that immigrants are human!” coalition director Javier Hernandez told those in attendance. 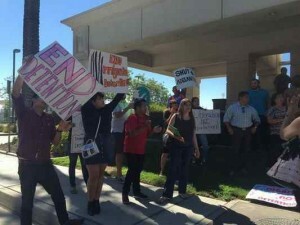 The protest was part of a planned week-long series of events aimed to call attention to conditions at the Adelanto facility. The 5-year-old center has been the target of protests for years. It also was the second time this year that a group protested in front of the building, according to a security guard, but this time, a second group, Claremont-based group We The People Rising, came to counter-protest. Robin Hvidston organized the We The People Rising counter-protest and said they speak for people killed by undocumented immigrants. “This is about breaking our laws,” said Hvidston. Jennaya Dunlap, with the Inland Coalition of Immigrant Justice, said she condemns the crimes and deaths caused by some immigrants, but she said immigrants commit crimes at a lower rate than the native population.